Comfort, practicality, and protection from the elements are central qualities of riding attire, though it has always been considered stylish. Distinctive accessories marked equestrian costume from streetwear: sturdy knee-high boots with a heel and sometimes spurs for both men and women, a crop, whip or cane, gloves to spare the wearer from the chafing of leather reins, and most importantly a hat for style and later a helmet for safety. 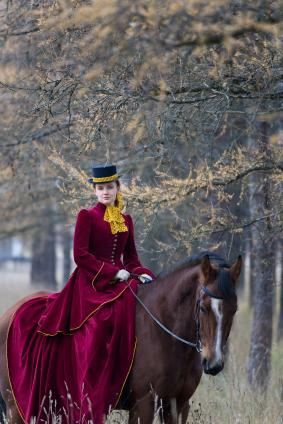 Contemporary riding dress still emphasizes comfort and protection but modern materials are used in its construction, including cotton-lycra fabrics for breeches, polystyrene-filled helmets, and Gore-Tex jackets, bringing it in line with high-technology clothing used in other sports. The materials worn for riding from the mid-seventeenth to the early twentieth centuries were easily distinguished from the silks, muslins, and velvets of fashionable evening dress. Equestrian activities required sturdy and often weatherproof fabrics such as woolen broadcloth, camlet (a silk and wool or hair mixture), melton wool, and gabardine for colder weather and linen or cotton twill for summer or the tropics. In the eighteenth and early nineteenth centuries, habits were frequently adorned with gold, silver, or later woolen braiding, often imitating the frogging on Hussar or other military uniforms. For example, in Wright of Derby's double portrait of Mr. and Mrs. Coltman exhibited in 1771, both wear stylish riding dress. Thomas Coltman's dress consists of a deep blue waistcoat trimmed with silver braid, a loosely fitting frock coat, high boots, and buckskin breeches fitted so tight that the outline of a coin is visible in his right-hand pocket. British styles of equestrian dress strongly influenced civilian fashions in other countries. In particular, French Anglophiles imitated British modes as early as the eighteenth century. The British frock coat became known as the redingote in France, a corruption of the word "riding-coat." Equestrian influence has subtly shaped men's dress to the present day, and vestiges of it remain in the single back vent of coats and suit jackets, which derive from the need to sit comfortably astride a horse and wick off the rain. Mary Coltman sits sidesaddle and wears a habit in one of the most fashionable colors for women in the eighteenth century when red, claret, and rose were in vogue. Her light waistcoat is trimmed with gold braid and she sports a jaunty plumed hat. Other portraits that feature eighteenth-century riding dress include Sir Joshua Reynolds's portrait of Lady Worsley and George Stubbs's double portrait of the Sheriff of Nottingham and his wife, Sophia Musters. In the nineteenth century, riding dress became more subdued in style and hue for both sexes. The early nineteenth-century gentleman wore a single-breasted tail-coat, sloping in front with a single-breasted waistcoat and cravat or stock. On horseback, he wore the same garments on his upper body but his coat might have distinctive gilt buttons. His legs required more specialized garments: breeches made from buckskin were typically worn and for "dress" riding trousers or pantaloons with a strap to keep them from riding up. If he wore shoes rather than boots, he could use knee-gaiters to protect his legs. Because of their practicality, lack of decorative detail, and allowance for mobility, women wore riding habits not only on horseback but also as visiting, travelling, and walking costumes during the day. For women, the upper half of riding habits often differed little from the clothing worn by their male counterparts, with the addition of darts and shaping for the bust. The bottom half of the horsewoman's costume expressed her femininity. Because ladies were expected to ride sidesaddle from the fifteenth to the early twentieth centuries, they wore skirts specially designed for the purpose. This contrast between the masculine upper half and feminine lower half led one early eighteenth-century writer to call it "the Hermaphroditical." While skirts tended to be relatively simple in cut and construction and quite voluminous in the early modern period, the Victorian habit-skirt was a masterwork of tailoring. Because the skirt could catch on the saddle in the event of a fall, injuring or killing the rider, many "safety skirts" were designed and patented by British firms like Harvey Nicholl and Busvine. These asymmetrical shorter skirts took many forms, including the apron-skirt, a false front that covered the legs when mounted and could be buttoned at the back when the rider dismounted. A plainness, amounting even to severity, is to be preferred before any outward show. Ribbons, and coloured veils, and yellow gloves, and showy flowers are alike objectionable. A gaudy "get-up" (to make use of an expressive common-place) is highly to be condemned, and at once stamps the wearer as a person of inferior taste. Therefore avoid it. The Victorian period introduced breeches and riding trousers for women. This garment prevented chafing and was concealed under the skirt. Tailors and breeches-makers often advertised a lady assistant to measure a woman's inseam, and the resulting breeches were made from dark wool to match the habit and remained invisible if the skirt should fly up. Colonialism, female emancipation, and increased participation in a wide variety of sports, especially bicycling, changed women's relationship with the riding costume. On their travels, women used horses for practical transportation and exploration and these animals were not always broken to ride sidesaddle. For safety and comfort, women had to ride astride and new habits with breeches or "zouave" trousers and jackets with long skirts were devised. Jodhpurs, named after a district in Rajasthan, were based on a style of Indian trousers that ballooned over the thighs and were cut tightly below the knees. These became popular for both men and women on horseback. "Ride astride" habits began to become acceptable in the first decades of the twentieth century, though many women continued to ride sidesaddle until mid-century. A 1924 illustration in American Vogue shows both a more formal black sidesaddle habit worn with cutaway coat and top hat and a tweed ride-astride habit worn with jodhpurs and a floppy-brimmed hat. Tweeds were standard for informal riding wear such as "hacking jackets." In the second half of the twentieth century riding had evolved in the directions of both recreation and competitive sport and specialized clothing with higher safety standards had become the norm, and less expensive materials like rubber replaced leather boots while polar fleece, Gore-Tex, and down jackets were used for warmth and waterproofing. Different types of equitation demanded variations in dress and etiquette. While horses were often the most practical means of transportation in the eighteenth century, the advent of rail travel increased the popularity of riding as a leisure activity. The degree of formality in dress depended on whether the activity was an informal country hack, an aristocratic foxhunt, or a ride in an urban park. The most fashionable urban sites for riding were Rotten Row in London and the Bois de Boulogne in the west of Paris. Functional clothing worn for work with horses included the carrick or greatcoat of the coachman with triple capes to keep off rain and snow. Each equestrian profession, from the groom to the liveried postillion, had a distinctive form of dress. Those who worked in agricultural contexts around the world developed specialized attire, such as the leather or suede chaps worn by the American cowboy, the sheepskins worn by herders in the French marshes of the Camargue, or the poncho worn by gauchos in South America. Hunting clothing was often regular riding clothing adapted for convenience and protection from the elements. In the eighteenth century some hunts adopted specific colors and emblems, though the red coat was by no means universal and green, dark blue, and brown were popular. Red woolen frock coats or "hunting pinks" with black velvet collars were the mark of the experienced fox-hunter. Racing developed its own specialized clothing as well. In contrast with the thick and waterproof garments worn on the hunt, the jockey's clothing had to be light and streamlined, fitting the body very tightly. By the early eighteenth century, jockeys were wearing attire that is recognizable in the early-twenty-first century: tight jackets cut to the waist, white breeches, short top-boots, and peaked cap with a bow in front. At that time, the cap was black; but the bright and highly visible, often striped or checked "colored silk" livery of the jacket made the owner's identity clear. Satin weaves gave these silks their glossy sheen. Because of its sexual appeal and bright coloring, jockey suits were often copied in women's fashions by nineteenth-century couturiers like Charles Worth. "She wore the colours of the De Vandeuvres stable, blue and white, intermingled in a most extraordinary costume. The little body and the tunic, in blue silk, were very tight fitting, and raised behind in an enormous puff … the skirt and sleeves were in white satin, as well as a sash that passed over the shoulder, and the whole was trimmed with silver braid which sparkled in the sunshine. Whilst, the more to resemble a jockey, she had placed a flat blue cap, ornamented with a feather, on the top of her chignon, from which a long switch of her golden hair hung down in the middle of her back like an enormous tail. (pp. 289-290) "
Because of its traditions of equestrian sport, Britain has led the Western world in making riding costumes. Men could go to their habitual tailors who specialized in sporting dress. The fabric used for making women's habits could be very expensive and because of the amount of cloth needed, it often cost substantially more than an evening gown. Like men's suits, riding habits were expected to last several years and to stand up to intensive use. Despite its elite connotations, ready-made habits were available in the eighteenth century from mercers and haberdashers' shops, and in the nineteenth century from department stores and working-class men's clothiers and outfitting firms trying to move upmarket by advertising "ladies' habit rooms." At the upper end of the market, firms offered luxury services to their clientele. In the 1880s, British tailoring firms such as Creeds opened branches in Paris. The suites of the British women's tailor and couturier Redfern in Paris, situated on the rue de Rivoli, were celebrated as "the rendez-vous of all the sportswomen whom the foreign and Parisian aristocracy count among their number." Redfern proposed stuffed block horses of several colors so that his clients could choose their habits in a tone that matched the hide (robe) of their favorite mount. The word for the hue of a horses' hide and woman's dress were the same in French. Riding attire has always symbolized grace and leisured elegance. It implied that its wearer belonged or aspired to belong to the horse-owning classes. Wearers often used it to challenge formal social mores in dress, deportment, and gender roles. Its rustic simplicity and informality connoted youth, ease, and sometimes impudence. For example, the dandy George Bryan Brummell made riding dress fashionable in the salons of Regency Britain, bringing "rural" modes into an urban setting. For horsewomen, etiquette was more stringent. Any woman who wore gaudy or overly ornate habits or who made a spectacle of herself was in danger of being branded a "pretty horsebreaker" or "fast woman" rather than a "fair equestrienne" in the Victorian period. Contemporary fashion designers continue to recycle traditional equestrian motifs and fabrics in haute couture and prêt-àporter collections. In this context riding costume is most often used to connote country elegance and traditional elite English style. See also Boots; Breeches; George (beau) Brummell; Protective Clothing. Arnold, Janet. "Dashing Amazons: The Development of Women's Riding Dress, c.1500-1900." In Defining Dress: Dress as Object, Meaning and Identity. Edited by Amy de la Haye and Elizabeth Wilson, 10-29. Manchester U.K.: Manchester University Press, 1999. Cunnington, Phillis, and A. Mansfield. English Costume for Sports and Outdoor Recreation: From the Sixteenth to the Nineteenth Centuries. London: Adam and Charles Black, 1969. David, Alison Matthews. "Elegant Amazons: Victorian Riding Habits and the Fashionable Horsewoman." Victorian Literature and Culture 30, no.1 (2002): 179-210. O'Donoghue, Power [Nannie]. Ladies On Horseback: Learning, Park-Riding and Hunting, With Hints Upon Costume, and Numerous Anecdotes. London: W. H. Allen, 1889. Zola, Émile. Nana. London: Vizetelly and Company, 1884.